Apple has updated their MacBook and MacBook Pro lines of notebooks with Kaby Lake CPUs, optional 16GB of RAM for all models, and improved dedicated graphics for the 15-inch MacBook Pro. The base model MacBook Pro 13 also saw a price-drop to US$1299. The biggest news out of Apple at this year's Worldwide Developers Conference (WWDC) seems to be the new iMac Pro, while the MacBooks received much less of the limelight. Well, that's largely because the updates to Cupertino's notebook computers were essentially the minimum the company was expected to perform. This WWDC saw Apple finally upgrade its MacBook notebook line to Kaby Lake across the board, plus offer 16GB of RAM in all their new models. For many people, the biggest change to the MacBook line was likely the non-TouchBar 13-inch MacBook Pro's price dropping to US$1299. In addition to Kaby Lake CPUs (which provide a modest ~200 MHz boost in frequency and enhanced battery life), all MacBook and 13-inch MacBook Pro models now have the option of upgrading to 16 GB RAM. There is still no option for 32 GB of RAM in any of the models, however. The 15-inch MacBook Pro has also seen an upgrade to its dedicated graphics: while the 2016 model offered Radeon Pro 450, 455, or 460 GPU options, the 2017 refresh has been updated with a choice of either a 2GB Radeon Pro 555 or 4GB Radeon Pro 560. Don't let the jump in numbers fool you, though: the Radeon Pro 555 is not much faster than the previous generation's 450, while the Radeon Pro 560 is around the same power as Nvidia's GTX 1050. 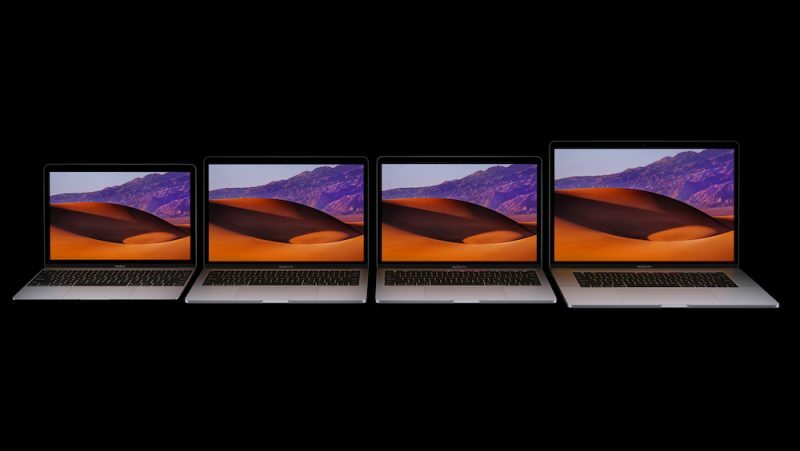 If your willpower is at an all-time low and you have to get the 15-inch MacBook Pro today, it's only a US$100 upgrade to go from the 555 to the 560 — we'd recommend going for the Radeon Pro 560. Finally, the venerable MacBook Air 13 got a new 1.8 GHz CPU (it was unclear exactly what generation the CPU was) but no updated screen, as was expected. Overall, this WWDC was likely not a disappointment for Macintosh fans waiting for a spec-bump — but it's a fair bet that nobody had their socks blown off over the MacBook updates, either.